Preheat oven to 325 degrees F. In a small saucepan combine 1/2 cup of the dried cherries and the cherry juice; bring to boiling. Remove from heat; let stand for 15 minutes. Drain cherries, discarding juice. Make five or six slits (about 2 inches deep) in ham. Press some of the soaked cherries into each slit. 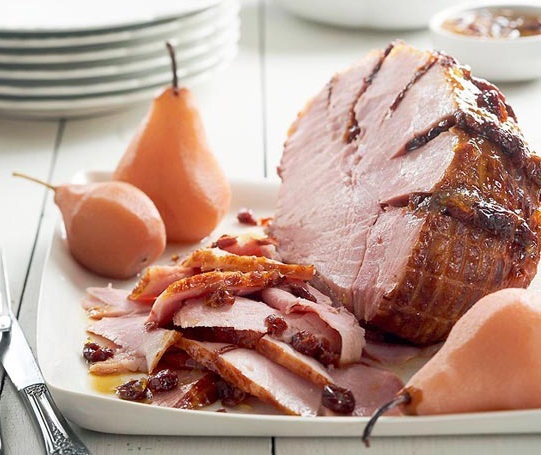 Place ham on a roasting rack in a 13x9x2-inch baking pan or baking dish. Cover with foil. Bake about 2 hours or until thermometer registers 140 degrees F.
Place peach preserves in a small bowl; snip any large pieces of fruit. Stir in the remaining 1/2 cup dried cherries and the lemon juice. Spoon 1/2 cup of the preserves mixture over ham. Bake, uncovered, for 10 minutes more. In a small saucepan heat the remaining preserves mixture and pass with the ham.